page, zion, and vegas road trip — ...and we're off! on may 23, 2013, we quit our jobs and began our year of "pretirement." these are some of our adventures around the world. as i sat in the backseat of the beemer watching the arizona desertscape fly past, i thought about how lucky we were to be doing whatever we pleased, completely free of any obligations. there we were, happily buzzing along the highway with alex's parents at the start of another great road trip. on our way to page (a remote town along the northern border of arizona), we pulled off the road twice - first to watch the amazing sunset, then to gaze up at the stars that completely filled the night sky. starlight will never cease to amaze me. we spent the night in page and enjoyed a deliciously filling dinner at the "best mexican restaurant in town." the next morning we did a short hike to horseshoe bend and spent a few hours admiring the view. the colorado river really is quite the artist. we would've loved to stop by its other masterpiece, but the grand canyon was just a little too out of the way. we continued our drive to zion national park and made a quick stop in colorado city, a mormon fundamentalist stronghold. the town is very small but full of huge, half-built homes that are nevertheless occupied. it's as if they ran out of money for proper siding and windows. having recently read under the banner of heaven, i was curious what fundamentalist mormons were like in real life. we pulled into the merry wives cafe parking lot and popped inside the local convenience store. i chatted briefly with the woman behind the counter, her pre-teen daughter a few feet away. the strange thing was that they seemed...happy. obviously not all fundamentalist mormons do terrible things, but knowing what few rights these women have in their community, i couldn’t help but wonder if their faith and unwavering trust in their leaders had blinded them. in any case, the sheriff also happened to be in the store, so we timed our short visit just right. after awhile we'd headed back to the car with a case of the hebejebes. 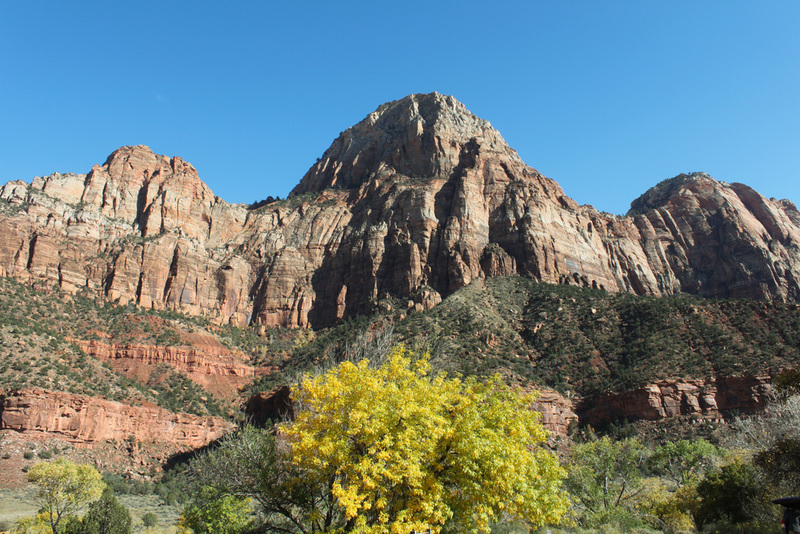 we eventually arrived at zion national park in the early evening and settled in. a friendly local gave me her local’s card so we'd get 20% off our meal at one of the best restaurants in town. score! the next morning we got up early and were rewarded with a family of four mule deer quietly grazing right by our rooms. we spent the whole day hiking the kayenta trail, emerald pool trails, and the riverside walk that follows the virgin river to the narrowest part of the canyon. the fall foliage was breathtaking. 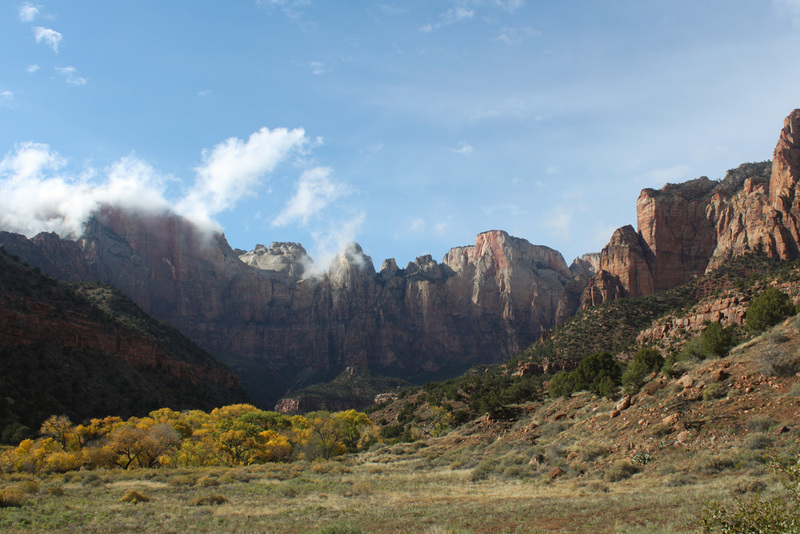 throughout the day we had alternating periods of rain and sunshine, giving us a glimpse into the zion's many different looks. it may be smaller than other national parks, but this place is beyond gorgeous. i’ll let our pictures do the talking. cindy's halloween outfit, minus her light-up pumpkin shirt! after spending a couple days surrounded by beautiful landscapes, we headed to nature’s polar opposite. vegas is alex's mom's second home. she’s been there more times than she can count and just can't get enough of the glitz and games. we stayed downtown at the golden nugget – the original vegas – and spent our first night gambling there and our second on the strip. i’d been to sin city before but was never old enough to gamble, so this time i was pretty pumped. i'm a blackjack and roulette fiend, and easily spent a total of 14 hours sitting at the tables and making friends with whoever was there. this included an 83-year-old woman celebrating her 50th wedding anniversary and a table full of packers fans. we are definitely everywhere! that night alex tried to peel me off the blackjack table but gave up and went to bed at 3am. he thinks i’m going to turn into one of those old asian ladies who can’t stop gambling. kind of like my lola…haha! at one point i was down $200, but by the end of our two days i was back up to only $35 in the hole. not too bad for vegas! my tito bobby and tita agnes also invited us over for lunch and wine at their home in henderson, which was beautiful. on halloween day it was time to say goodbye to alex's parents. cindy came prepared for the holiday. on our way back to phoenix, we drove through joshua tree and marveled at just how many of these funny-shaped trees dotted the desert. with the sun setting in the background, it was a gorgeous going-away present from the southwest. we made it back to the city, parked our car at the mobile home, and got our packing in order. the next morning we bid farewell to the m3 and set off for houston. parsa and kevin were getting married!